After a long, cold and wet winter everything is starting to grow again. Getting it back in tip top shape can involve moss killing, weeding and regular mowing. 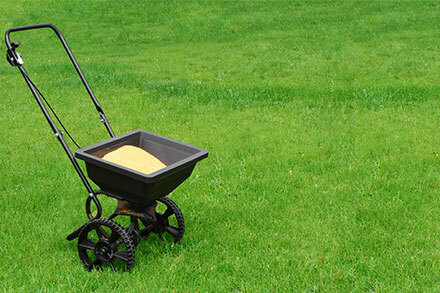 In this post, we will focus on what fertiliser to use to achieve a healthy green lawn. At The Grass People we have a range of fertilisers that all do different things and can be used at different times of the year. Obviously at this time of year you want a fertiliser that is best used in spring/summer. Below we’ve written a simple guide that should help you choose the right fertiliser. After all, getting that first feed at the start of spring is key and will impact on how your grass looks for the rest of the season. NPK stands for the symbol of the chemical elements that make up plant fertilisers. They are vital for healthy plant growth, but not always readily available in the soil. Some soils are deficient in one or more elements and need some extra help, and certain plants require exceptionally high levels of an element. There are different ratios of each element. The percentage levels of each element present in the fertiliser are indicated by three numbers, representing the N P K in that order. A bit like a balanced smoothie for your grass! This is strictly for newly sown grassed areas. Should be spread at the time of sowing or shortly afterwards. This will fill the ground with rich nutrients and help create the perfect environment for seed germination. If spreading on new seedlings it’s important to water the area thoroughly after application. This acts fast and can give your lawn a real boost. You’ll notice that the colour becomes a deeper green and looks much healthier. This can be just what the doctor ordered after a harsh winter. Use a spreader as uneven distribution can scorch the grass. Slow release fertiliser is certainly the safer option. Will feed grassed areas consistently over a period of 12-16 weeks. Will promote much more uniform grass growth. Minimal risk of scorching in comparison to quick release fertilisers. Watering will promote an immediate effect as the granules need moisture to breakdown. Made from natural seaweed with nitrogen. Like the quick release fertiliser this acts as a great spring/summer boost to your grass. The seaweed extract helps root development and improves shoot density. The added nitrogen is there to give a quick boost to grass growth. This does exactly what it says on the tin. If you have a problem with moss and weeds then this is what you need. Obviously if you have a lot of moss and weeds you’ll need to remove these. This will lead to bald patches which you will need to overseed. Check our overseeding guide here. For spreading rates and usage times check out the usage guides on each of the fertiliser product pages. That’s all there is to it. Have a read of this post, decide what’s best for you and get to work!